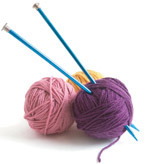 Knitting is the creative outlet Judy Yang, D.O., a pediatrician with the NorthBay Center for Primary Care in Vacaville, says keeps her relaxed and focused. 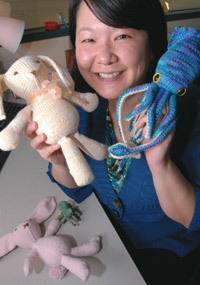 Dr. Yang discovered her craft one winter during her residency in North Carolina. She needed a plan for her family’s Christmas gifts that year—preferably something that would also keep her hands warm in the chilly winter. It couldn’t be too expensive, and if it involved some sort of creativity it’d be a bonus. She had always admired the beautiful knitted and crocheted blankets volunteers made for the premature infants in the Neonatal Intensive Care Unit, where she worked long hours at Wake Forest University Baptist Medical Center in Winston-Salem, NC. Encouraged by the many knitters amongst the NICU nurses, she learned to knit. The rest, as they say, is history. She still cringes recalling those very first Christmas presents. “They really were horribly ugly scarves. I sure hope no one kept them,” she says with a chuckle. Currently, her favorite thing to knit are toys—the more complex the better, as she enjoys the 3-dimensional modeling aspect the most. Knitting has also brought her a whole new circle of friends that she wouldn’t have other-wise met, a surprisingly social aspect she hadn’t considered before. A knitting circle near her home allows her and similarly obsessed folks to share their fiber creations, while discussing anything from politics to family. In addition, knitting for charity is very popular amongst knitters, who make and send items to Afghans for Afghans and the Red Scarf Project (orphans headed for college). One online knitter even spurred many other knitters to raise over $1,000,000 for Doctors Without Borders. Recently Dr. Yang made several items for a charity auction to help underserved children continue their classical music education in the Los Angeles area. “I do like creating things with my hands,” she says “whether it’s music or working with metal, but fiber has been the strongest connection so far. ” What’s more, it’s a good, creative outlet that is both meditative and relaxing, she explains. Below is one of Dr. Yang’s favorite recipes. This low-fat soup is rich in calcium and antioxidants. Puree 1?4 cup oil, chives, and cayenne in blender. Season with salt. Heat 1 tablespoon oil in large saucepan over medium-high heat. Add onion and bay leaves; cook until onion is golden, stirring often, about 7 minutes. Add broccoli; stir until bright green, about 1 minute. Add broth. Simmer until broccoli is tender, about 5 minutes. Remove bay leaves. Cool soup slightly. Working in batches, puree soup in blender until smooth, about 1 minute per batch. Return soup to pot. Re-warm until hot. Season to taste with salt and pepper. Divide soup among six bowls. Drizzle with chive-cayenne oil and serve. Any remaining chive-cayenne oil is delicious drizzled over mashed potatoes. It can also be used as a topping for steamed fish or as a dipping oil for crusty bread.